Kre-Alkalyn creatine is a creatine product that contains "buffered creatine" in capsule form that supposedly does not get metabolized by the stomach and arrives to your muscles in its more pure form. Unlike most creatine products, Kre-Alkalyn Creatine is a patented formula. The American Council on Exercise, or ACE, considers creatine to be well-tolerated and a safer alternative to other performance enhancing drugs. Despite this, there may be some side effects that you may encounter from taking creatine. Please consult your physician before taking this or any other dietary supplement. 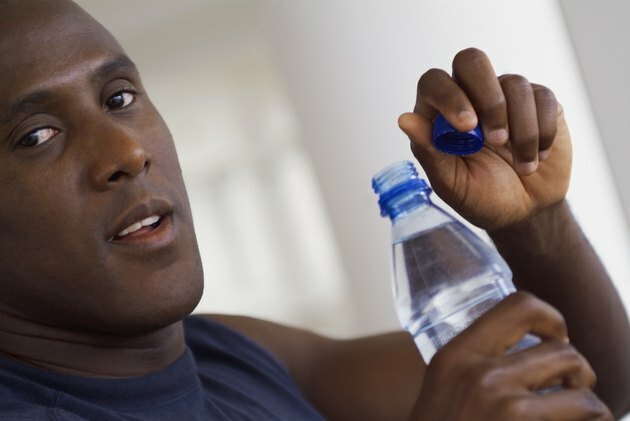 If you do not drink enough water, you can get dehydrated while taking creatine. Dehydration is among the most common side effects of taking creatine. MedlinePlus states that creatine products work by having your muscles draw water from other areas of your body. Dehydration is particularly a concern for athletes who practice or play in hot climates for long periods of time. According to Vanderbilt University, if wrestlers taking creatine attempt to lose weight to make a required weight by using diuretics or not drinking water are subject to severe muscle cramping and dehydration risks. The University of Maryland Medical Center states that you should never use diuretics and creatine simultaneously. Columbia University reports that your body can handle and process up to 60 cups of water a day, so drinking too much water is usually not an issue. Creatine can potentially interact with other medications or dietary supplements and produce negative side effects. The University of Maryland Medical Center says you should avoid high doses of caffeine while using creatine. They also discourage the use of NSAID pain killers like Advil, Motrin, Aleve and Tylenol. Combining NSAID pain relievers and creatine may promote kidney stress. A potentially rare but extreme side effect of taking creatine is acute kidney failure, which can happen if you have a history of kidney dysfunction. According to the University of Maryland Medical Center, taking a creatine for long periods of time at very high doses can result in kidney problems. They state that you should not take any creatine product if you have a history of kidney dysfunction, liver dysfunction or high blood pressure. What Happens If You Don't Drink Enough Water While Taking Creatine?